Village Realty guests are cordially invited to stay at the beautiful First Colony Inn, located at 6715 S. Croatan Hwy on the beach road in Nags Head. Whether you are looking to arrive early or extend your vacation longer than your home rental duration, the First Colony Inn is the perfect place to do so! Begin your day with a deluxe, hot breakfast and end the afternoon with our wine and dessert social. You can lounge by the pool, follow the boardwalk to the beach, or read or play games in the library. End your afternoon with a friendly game of croquet. After dinner, enjoy the sunset from a rocker on the encircling verandas. The rooms at First Colony Inn each have a private bath with fluffy towels on a heated towel bar and English toiletries. A television, telephone, and refrigerator are standard in each room. Luxury rooms boast wet bars and kitchenettes, and some have Jacuzzi whirlpool tubs, sitting rooms or private screened porches. 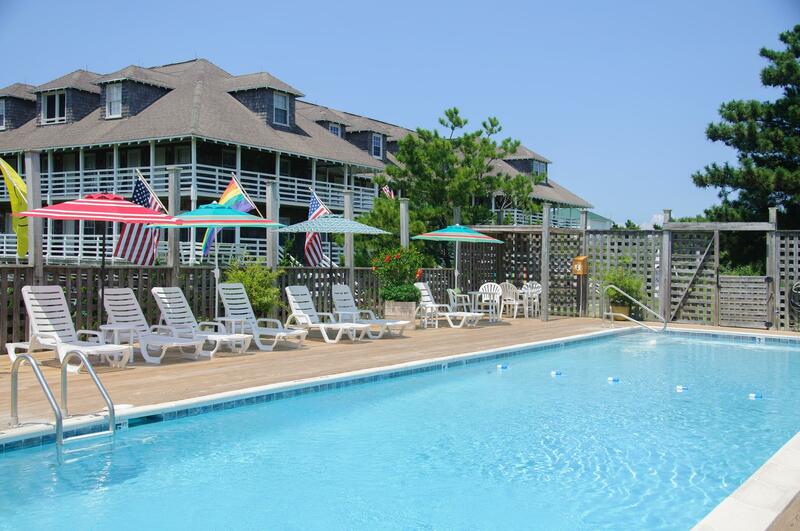 All guests of First Colony Inn also have access to the Outer Banks YMCA. Visit the First Colony Inn website or call 855.353.0883 to book your room directly with the innkeepers.